Each abstract photo I make is unique. I don't do editions. 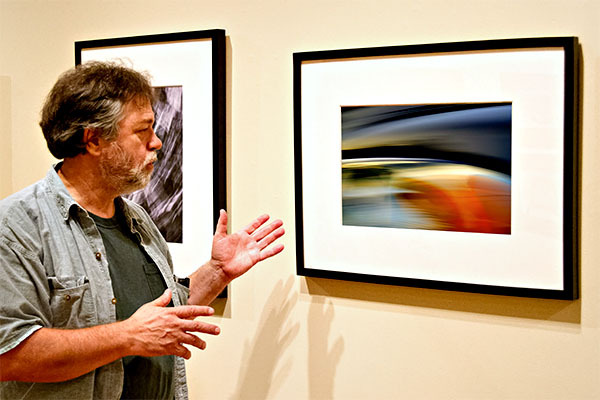 Every time I print an image, I go back to the original camera file or composite, and reproduce the image, using new software or techniques as they evolve in the digital photography world. I create several new test prints to assure that the print conforms to my original vision while also reflecting any enhancements to the process at the time of the printing. Each final print will have its own unique quality which may vary from the images on the screen or prior prints of the same titled artwork. In many cases, I make the final print myself; in other cases I send the image out to be printed by expert custom printers using equipment costing hundreds of thousands of dollars to produce highly technical prints that I cannot produce in my studio. To buy an image, simply email me at (robogravure (at) gmail • com), and let me know you have an interest in purchasing a print and we can begin a dialogue about size and type of print. Each print I make is custom, so prices vary accordingly. Packing and shipping is additional, and crating is available for large artworks. Prices range from $250 for the smallest print available (8" x 10") to $10,000 for custom stretched and finished 36" x 54" canvases. Large custom resin-coated prints and special size dye sublimation prints (60" +) may be more. 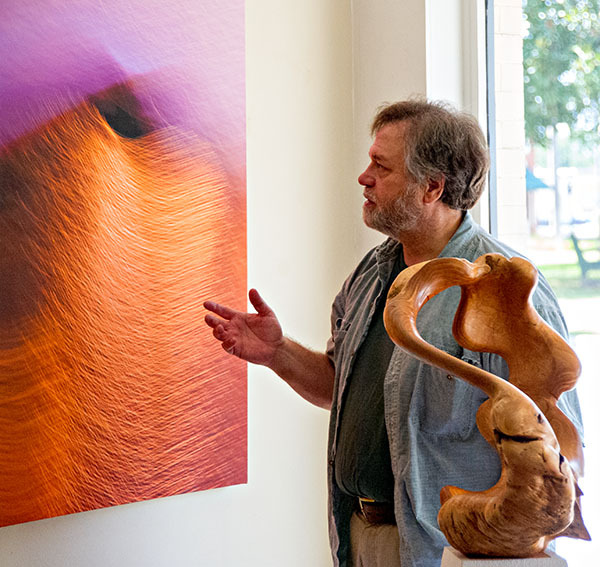 In every case, I strive to offer a custom, creative purchasing experience and promise to deliver exquisite, museum-quality work at appropriate prices. (All prints are printed on museum quality substrates with archival inks). Mark Lindquist with JetStreamLine, matted and framed. Professional Glossy or Metallic paper suitable for framing available in 13 x 19, 16 x 20 and 20 x 24, (and custom sizes) shipped rolled or mounted on mat board. Printed on an archival large format inkjet printer on 100% cotton and acid free paper. Smooth and beautiful Fine art velvet prints look and feel like watercolor paper with a matte finish. My canvas prints are specially printed using the highest quality archival canvas with 200 year archival longevity inks. The canvas is machine and hand-stretched, and finished with archival coating to ensure UV protection and longevity. Exceptional care is given to ensure a beautiful object of museum quality. Generally, my canvas prints are in sizes for large verticals, 36" x 54", Large Horizontals, 30" x 45", and square images are typically 38" x 38". Smaller and larger prints are available. 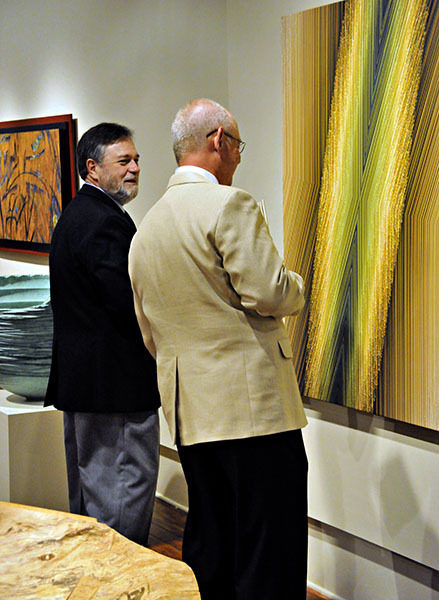 Mark Lindquist (left) discussing archival aspects of the canvas print Conga at a museum exhibition of his work. Conga is 36" Wide X 54" High. Dye Sublimation Prints - the image is infused into the surface of a solid sheet of metal (aluminum). Rich iridescent sheen, bright vivid colors, and a life-line depth of detail that can't be matched by conventional paper prints. The image is waterproof, weatherproof, and scratch resistant and can even be cleaned with glass cleaner. 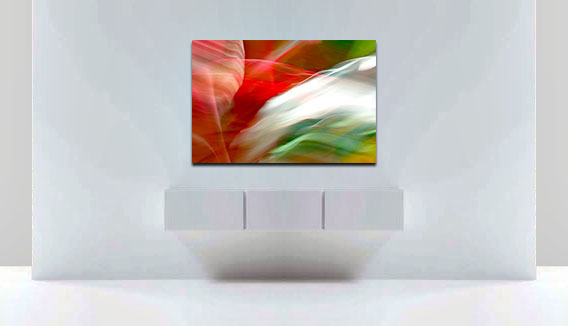 A floating mount suspends the image ½" away from the surface of the wall. Crystal clear and glossy with rounded edges mounted on aluminum. 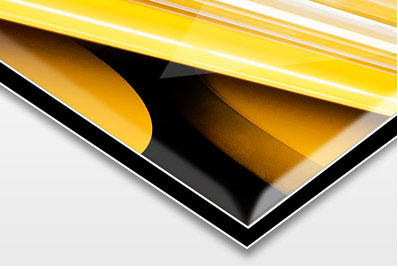 The photo print (on archival photo paper) is laminated onto a strong aluminum Dibond base. The image is immersed within a transparent composite resin. The process produces rounded edges and the impression of being surrounded by a glass droplet. The extremely glossy resin gives the image profound depth, brings out the finest details, and ensures the images have maximum luminosity. Highly hand-labor intensive, requires approximately 1 month to produce. Close-up of corner detail of resin-coated laminated print.